Sree Sreenivasan, dean of the Journalism School at Columbia University, and one of his graduate students, Vadim Lavrusik, created a list of social media skills needed by future journalists. 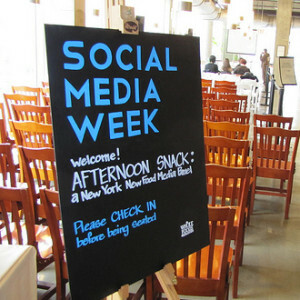 Together, they presented the list in slide show format at a Mashable NextUp NYC Event during Social Media Week. Another theme in Sreenivasan and Lavrusik’s presentation is community. I don’t think anyone would disagree with the importance of community building and management in the future of news. Their suggestions for achieving this are for the future journalist to build his or her own brand and distinctive voice, to connect his or her audience members and facilitate conversation between them, and to use social media to listen, not just to broadcast. Sreenivasan and Lavrusik also think business prowess and entrepreneurial spirit are important qualities in a future journalist — another set of suggestions I’m not so sure are going to be necessary. They seemed to be focused on the industry devolving as such that each person on a news team will need to wear multiple hats. Despite changes in the industry, I guess I remain just a little more optimistic. As the duo points out at the beginning if their presentation, however, social media is still in its infant stages and like other mass media at similar points in their history, predictions made now won’t necessarily pan out. Other skills listed during the presentation for the future journalist include strong SEO and linkage understanding, and using metric tools like Google Analytics and Nielsen. Sreenivasan and Lavrusik also stress working collaboratively and being a “permanent learner,” which are good skill sets for any career. Image by David Berkowitz, used under its Creative Commons license.